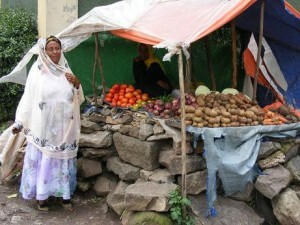 Women’s co-op group member at her market stall. 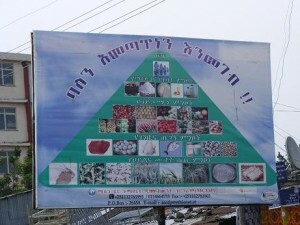 MCDP, a long-time CFTC partner in Ethiopia, is currently engaged in a significant public education campaign to raise awareness of good nutrition practices among women living in Kirkos Sub-City, an impoverished neighbourhood of Addis Ababa, Ethiopia. It’s using billboards, stickers, and other communications materials to create a dialogue and convey information about what a balanced diet is, how to incorporate healthy eating and proper nutrition into family diets using local foods and traditional dishes, and how to purchase, store and prepare food safely and in healthy ways, even with limited resources. What’s especially exciting for Canadian Feed The Children is that the broad-based healthy eating campaign is being linked to the work we are supporting building women’s livelihoods through women’s co-ops. “The groups that CFTC is funding, which offer business skills training and start-up support to vulnerable women, are vital to create meaningful and sustainable income-generating opportunities,” said Heather Johnston, Canadian Feed The Children’s Director of Programs. “We know that empowering women and increasing household income is a contributor to overall poverty alleviation and bettering women’s and children’s lives. But the question has always been, how do you make sure increased income actually goes toward improving family food security? 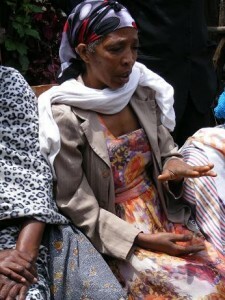 This program starts to build those direct links through the mechanism of nutrition education,” she added. 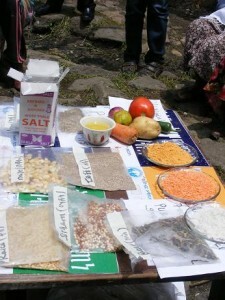 So far, the campaign has reached close to 300 women, bringing them together as part of their regular meetings through their co-op groups, to provide information and awareness about meal-planning; what are the building blocks of a balanced and nutritious diet; and how to ensure their children are obtaining healthy nutrition despite the challenges of poverty. The program places a strong emphasis on local foods and traditional dishes: how to incorporate all of the food groups into foods and meals that are familiar and available even to women living in poverty. The trainers also integrate crucial information on sanitation, hygiene and childhood nutrition, so that mothers are armed with the information they need to take the money they are earning through income-generating opportunities and put it into better nutrition for themselves and their families. After visiting the project in Ethiopia this past September, Heather came back more convinced than ever that nutrition education is a crucial, but sometimes missing, link between women’s economic empowerment and family food security. The recently-published work of the International Food Policy Research Institute on “hidden hunger” explores that link in more detail. Even as more countries are making improvements in eradicating poverty and hunger, with the latest estimates showing a decline in hunger worldwide (UN FAO, September 16, 2014), the incidence and consequences of hidden hunger remain high. More than two billion of the world’s seven billion people experience hidden hunger. Nutrition education is a recognized and important strategy to tackle the problem and, as the women of Kirkos Sub-City no doubt agree, a welcome addition to their skill set for feeding and caring for their families.